This morning at 10 a.m, three Palestinian residents of the Tel Rumeida District in Hebron accompanied by a handful of Israeli activists and media personnel as well as international volunteers successfully crossed an area off limits to Palestinians for the last six years. Tel Rumeida falls in the Occupation controlled H2 military zone of Hebron City and is illegally barricaded by the IOF even though there are many Palestinian residents within the area. Access is only available via a checkpoint and Palestinians are not allowed to drive their cars in the zone. The illegal Jewish settlers however, enjoy total freedom of movement and are infamous for their constant harassment and attacks on Palestinians. 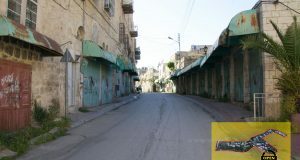 A recent Israeli High Court ruling stipulates that the restriction of Palestinian movement in Shuhada street has been mistakenly enforced for the last six years and that Palestinians in fact have the right to use this road. Armed with the court ruling the three men peacefully approached the area and were immediately stopped by an Israeli soldier outside the Beit Hadassah settlement who refused to look at the paper and physically attempted to restrain the Palestinians from bypassing. Five more soldiers then came running up from the checkpoint, soon followed by an army jeep with a few more soldiers. They read the court ruling and then telephoned the Border Police who arrived shortly thereafter. The soldiers then made the 3 men face and put their hands up against a wall and searched them while the police were on the phone. After approximately 30 minutes the soldiers and police allowed and escorted the Palestinian men as well as the activists through the area to the end of Shuhada Street and agreed that Palestinians shall henceforth be allowed to use this route unhindered by the IOF or settlers. The three men walked through a street in their own neighbourhood for the first time in six years and the happiness was evident on their faces. This represents a significant breakthrough in the human rights of the local Palestinians and a buzz was soon evident amongst residents in the area as the news spread. All that remains to be seen is if the IOF adhere to the High Court Ruling, and allow the Palestinians the freedom of movement which is now legally theirs. Despite assurances relayed by American and European diplomats, foreign passport holders trying to join their families in the Israeli occupied Palestinian territory (oPt), including Bethlehem, for the holidays are being denied entry and expelled by Israel. On Friday the 15th edition of the English newspaper, Palestine Times, reported that a senior American diplomat announced that Israel had annulled a previous decision banning entry to foreign passport holders who have family residing in the Palestinian areas and was resuming its earlier practice of issuing three month renewable visas that would allow them to visit and live together with their families. Attempts to understand from US officials more details surrounding this announcement have been unsuccessful, to date. In stark contrast to that announcement, at least three foreign nationals attempting to join their families in the Israeli occupied Palestinian territory were expelled last week. Kamal, an eighteen-year old US college student who had come to visit his grandfather and family in Ramallah over the holidays was denied entry at Ben Gurion airport on Saturday December 16th. Another Palestinian American from Cleveland, Ohio, Linda Ali Mahmmud, who is deaf and dumb like her brother Shukri, had traveled in the hopes of spending the holidays with her cancer stricken aunt but was denied entry at Ben Gurion airport on Thursday December 14th, allegedly because Shukri had overstayed his permit. Shukri had requested a routine permit renewal in October, however, the Israeli Ministry of Interior liaison at the Israeli Civil Administration suddenly stopped processing renewals for foreigners married to Palestinian ID-holders and refuses to accept Shukri’s application. Abdullah, a German national, who works for the International Peace & Cooperation Center in Jerusalem, had hopes of reuniting with his wife, who carries a Palestinian ID and their newborn child following statements made last week by European diplomats regarding Israel’s policy change. He was denied entry for the fourth time at the Allenby Bridge on Wednesday the 20th of December. “Arbitrary denials of entry and expulsions have not stopped. No transparent rules or mechanisms are in place so far. Palestinian families, vital service providers and businesses remain vulnerable to arbitrary denial of entry and residency. This is especially hard to accept at a time of major Christian and Muslim traditional festivities when families want to be together more then ever,” said Anita Abdullah speaking for the Campaign for the Right of Entry to the oPt . The U.S. government estimates that there are about 35,000 Palestinian Americans living in the West Bank at any one time, and an additional 10,000 Palestinians with other foreign passports. All these people and their families remain separated or at risk, and Palestinian educational and social service institutions, humanitarian agencies and businesses remain vulnerable to the loss of critical personnel, until applications for entry and residency in the oPt are decided in accordance with a clear, transparent and internationally lawful policy. This afternoon over 200 Palestinian, Israeli and international activists participated in a protest against the proposed new settler-only, apartheid road which will run from the Gush Etzion settlement block to the south and illegally annex Palestinian farmland, affect homes and destroy significant heritage sites including a cemetery in the Halhul and Beit Ommar villages near Hebron in the West Bank. 800 dunums of agricultural land from Beit Ommar and 240 dunums from Halhul is being confiscated for the construction of this road, and four large greenhouses belonging to the agricultural college will be demolished. Part of the road will form a viaduct over the existing “route 60″. At around 12:30 the crowd marched peacefully from a parking lot outside of Beit Ommar along route “60″ ntowards a nearby agricultural college in Al ‘Arrub Refugee Camp carrying placards and chanting anti occupation slogans. Palestinians as well as Israelis and internationals walked in unity against the illegal plan in the pouring, but long-awaited rain. A small group of Israeli policemen and soldiers were present at the starting and half-way points, but did not interfere in any way. The crowd then packed into the auditorium upon arrival at the college and were addressed by the mayor of Beit Ommar, a farmer from Halhul and a spokesperson from the Israeli contingent who voiced the support from the Israeli side in favour of the Palestinians who would be affected by the planned road. The locals were highly appreciative of all who supported and stated that it was the largest protest in the area to date. After listening to the mayor of Beit Ommar, a farmer and spokesman of Halhul and viewing some powerpoint images of the devastating effects of the planned road the crowd peacefully left the college. No soldiers or police were present at the conference and the protest ended without incident. Now all that remains to be seen is if the Israeli authorities heed and respect the non-violent message that was strongly conveyed to them today and change their plans which are illegal even by Israeli Law. Last night Israeli forces invaded Ramallah Old City around midnight, occupied a family home, blindfolded the twenty-year old son, banged his head against a door and refused to allow the grandmother suffering from diabetes to use the bathroom. Several jeeps, a hummer and an APC invaded Hizbe Al Qadim Street in Ramallah Tahta around midnight and demanded entry into a family home by banging with rifle butts on the front door. Forced with complying or having their front door blown open, the family opened and several soldiers were seen entering with large bags. Once inside the soldiers imprisoned the family in one room, blindfolded the son and started interrogating him about his political affiliations as well as banging his head against the door. Soldiers also damaged the walls with rifle butts. Whilst this was happening other military vehicles continuously shone their searchlights on the windows of neighbouring houses, focusing particularly on one flat. After around an hour the military vehicles left with the soldiers still in the house. Intermittent shooting including automatic gunfire was heard and about an hour later the IOF returned to pick up the occupying soldiers. No one was kidnapped. In the morning some neighbours identified blood on the walls. This event doesn’t seem to have received any local media coverage, as scenes like these are played out several times nightly across the West Bank. 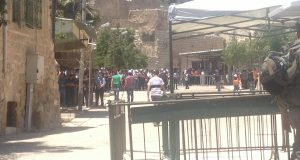 Mary: On this occasion some children who were going up at the very top of Tel Rumeida were being stopped from going home from school. For some reason at the top of the hill on private Palestinian land there were a whole lot of settlers having a picnic, a lot of them children. They were being guarded by a number of soldiers. The Palestinian children who were forced to use that way because they are not allowed to go up the street past the Tel Rumeida settlement, and have been told by the army that is the way they’re to go, were not being allowed past to their homes. Now this is against the Israeli law. They rang me because I’ve been there so long and understand the situation and the law to some extent although I’m not a lawyer. The officers are not very keen to talk to me, they expect me to respond to barked orders as though I was some sort of a dog at times but they will not discuss anything with me. Interviewer: So you protested, you tried time after time to get some official response to what you saw as a breach of Israeli law by stopping these children. What happened eventually? Mary: The police came. Now the police over the telephone to someone else had already admitted that it was their job to protect the Palestinian children but the police had not come to do so, so I told the police that they were breaking Israeli law if they did not help these Palestinian children get home. They refused to do that. Instead they said I must get in their jeep and they would take me to the police station and when I protested they said they would take me to the police station and come back to look after the Palestinian children but they did not go back and help out in this situation at all, they stayed at the police station. Interviewer: Mary, you are 75. Why would you, a widower of a former Anglican priest, want to put yourself through this, why would you want to be in that conflict zone.? Mary: I think it’s a call from God, but in Australia we don’t talk about God much, but that’s what I think it is. The thing that really keeps me there is that Palestinians tell me time and time again that my being there makes a difference to their lives. I do take risks and I go further with the children than either the army or the settlers want me to go. Interviewer: Have settlers ever attacked you? Mary: O yes, lots of times. They attack me outside my house. I don’t have to go up near their settlement to be attacked. Interviewer: And what kind of attack? Mary: I’ve been knocked over when I’ve been trying to protect children. Just on the 18th November three different settler women punched me when I was trying to stand between them and Palestinian children. Interviewer: Can you ever get any sense from those settlers who are so angry with you, why they think that there shouldn’t be Palestinians there? Mary: No, no, what they do if they talk at all rather than scream, is to rant at you. The men rant, very often with a finger right in my face, that I’m not objective but they are free to attack Palestinian children and they are somehow objective. It just makes absolutely no sense. Two international volunteers were illegally detained for over four hours this morning. 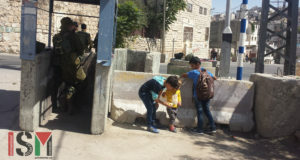 They were performing a routine visit to Qurtuba School to accompany Palestinian schoolchildren, who face physical violence and harrassment from settler-colonists. The two volunteers, from South Africa and Spain, were accused of entering a house that was a Closed Military Zone according to the soldiers, although they failed to produce the necessary documentation. The home, now deserted, was once occupied by a Palestinian family that has since left due to the constant and unbearable harassment and abuse by settlers. The home had been heavily defaced and marked with graffiti. This home is Palestinian property and the volunteers had no idea that this home was ‘out of bounds’. The soldier that detained them at first, radioed for his superior who arrived almost an hour later and released the volunteers. He did this after inspecting their camera and advising the volunteers not to wander into the abandoned homes. A few minutes later, the volunteers were detained individually at two separate checkpoints. The reason given for the subsequent detention was, “we were ordered to hold you until our superiors arrive to interrogate you!” It is highly unusual for IOF soldiers to detain foreign nationals as this is usually the responsibility of the police. In this case the police drove past but showed no interest in the incident. Today’s illegal detention is merely the latest example of harrassment by Israeli forces of human rights defenders (HRDs) in Tel Rumeida, stretching back nearly two years when an international presence was first established in Tel Rumeida. On December 17th an Australian HRD was held for four hours whilst settlers trespassed Palestinian land, and a month ago Amnesty International highlighted the risks HRDs face from attack by settlers and the lack of action by Israeli forces. Israeli activists have blocked central Tel Aviv with razor wire from the Apartheid Wall. The activists stretched the razor wire across Basel Street with a sign from the Wall that reads in Arabic, Hebrew and English: “Mortal Danger-Military Zone. Any person who passes or damages the fence endangers his life”. The twenty activists from Anarchists Against the Wall, who attend the weekly Friday demonstrations against the Apartheid Wall in Bil’in, set up the blockade at around 2pm and started handing out flyers to passers by explaining the action. The IOF shot rubber-coated steel bullets at Bil’in Popular Committee Member Abdullah Abu Rahme, wounding him twice in different parts of the leg. The soldier took aim and fired the bullets from less than 50 metres away at Abu Rahme’s leg after today’s peaceful demo against the Apartheid Wall in Bil’in. A larger than usual number of villagers participated in today’s protest on the eve of the Eid Al Adha feast. After marching to the gate in the wall, marchers passed between the gate and razor wire, which forms the first barrier in the wall. Soldiers clambered over the gate, a task made more difficult by the razor wire across the gate put there by the IOF, and tried to close off the opening. By this time the many protesters who had passed through, started walking along the ridge between the razor wire and the next obstacle in the wall formed by a three-meter high fence. Some looked for ways of scaling the illegal structure. Those left on the other side of the razor wire managed to find openings in it, and some reached the group protesting on the ridge despite the multiple rounds of sound bombs fired by the IOF. As the protesters reached the outskirts of the village they noticed soldiers in two empty houses and urged them to leave. The soldiers vacated one house but remained in the other despite requests from the villagers to leave. When the villagers entered the house the soldiers started lashing out at them with their batons causing cuts and bruises to arms and legs. Popular Committeee member Mohammed Katib and Farhad Burnat were among those beaten by the soldiers. Snipers occupying a nearby roof fired teargas at those in the vicinity of the house. Instead of leaving, the IOF invaded with several jeeps and soldiers started firing rubber bullets at protesters. Abu Rahme was shot as he was sitting on the ground by the house occupied by soldiers. Today’s demo was characterized by an escalation in IOF violence compared to recent weeks.